Condition is New. 1 Capricorn Sticker. 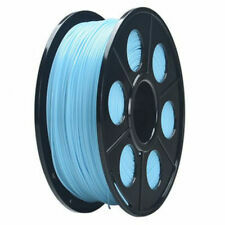 This tubing increases the quality and accuracy of your prints. Material: Highest Quality Pure Virgin PTFE. Density (kg/m3): 2300 /-100. Color: Dark Blue. 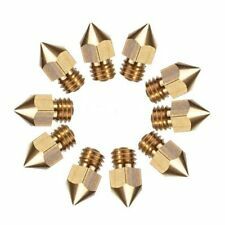 10Pcs Extruder Brass Nozzle. This nozzle makes printing with PLA easier. Note: Light shooting and different displays may cause the color of the item in the picture a little different from the real thing. 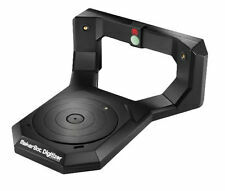 Only compatible with Creality 3D CR-10 & CR-10S. Fits for: Creality 3D CR-10 & CR-10S 3D printers. Supporting pull rods kit for 3D printers. For making your 3D printer much more stable to work. The 3D printer showed in the picture is not included. Features: BLTouch is an auto leveling sensor for 3D Printer based on open-source Simple, high-quality, smart and high-precision Used for 3D Printer CR-10/CR-10SPRO/ENDER-3 Packing includes: 1 x BLTouch 1 x Connector 1 x Tie 1 x Rack 2 x M3X8 1 x Pinboard A 2 x M3X6 1 x ISP Pinboard 1 x Burner Brand CREALITY MPN Does Not Apply To Fit 3D Printer Compatible Model For 3D Printer CR-10/CR-10SPRO/ENDER-3 Country/Region of Manufacture China EAN 0765756422345. XY Axis Positioning Accuracy 0.012MM. Z Axis Positioning Accuracy 0.004MM. Net Weight of 3D Printer 8KGS. 3D Printing Software Repetier-Host. Heating Plate Temperature 50-110 ℃ (Adjustable). Heating Plate Material Aluminum. 2 x V-SLOT 2040 Aluminium Extrusion - Black Anodized 340mm. 3 x V-SLOT 2040 Aluminium Extrusion - Black Anodized 313mm. 2 x V-SLOT 2040 Aluminium Extrusion - Black Anodized 440mm (PRE-TAPPED). - V-Slot is just like a generic 2020 rail and 100% compatible with standard 2020 Extrusion hardware and accessories. 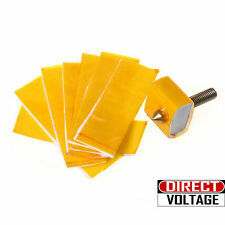 1 set x T8 anti-backlash spring loaded nut. 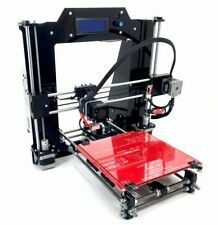 Aplication: 3D printer Reprap Z axis, CNC, etc. 1 set nut include 2 brass parts and 1 spring. Pitch: approx. Lead: approx. We will try our best to reduce the risk of the custom duties. Model Number: BIGTREETECH SKR V1.3. SKR V1.3 Usage instructions Usage: For 3D Printer. Latest version 32 BIT 100MHz microprocessor. Great upgrade for Creality Ender 3, CR-10, Prusa, Tevo, anycubic. An auto leveling sensor for 3D Printer based on open-source. Item type: Auto Press Bed Leveling Kit. 1 set of Leveling Kit. Used for 3D Printer for CR-10/for CR-10SPRO/ENDER-3. Anyway we will try our best to avoid this kind of thing. 1 x 3D Printer Extruder J-head Hotend Bowden for 1.75mm/0.4mm. while increasing the number of fins, the heat ends while reducing weight, with better thermal performance and stability. but also to the feed tube deeper hot side, feeding more powerful (pneumatic connectors can only be inserted a short feed pipe into. ). Suitable For Creality Ender 5 Range. The high quality PTFE Bowden tube is supplied in a perfectly cut 50cms length, ideal size for the Ender 5 range. High Quality PTFE With Additives For Low Friction & Heat Resistance. Modell: TMC2208. SpreadCycle High Chopper Frequenz, dcStep, stallGuard2 Stall Erkennungstechnologie;. CoolStep aktuelle dynamische Anpassung Technologie, kann es 70% der Energie sparen, StealthChop stumm; Die automatische Umschaltung von Stealthchop und Spreadcycle haengt von der Geschwindigkeit ab. MKS TFT28 Display Compared to the TMC2100 stepper motor drive module, the TMC2208 drive module generates less heat. The heating effect of TMC2208 is about 0.8A and the heating effect of 2100 is 0.5A. This drain tool tilts the platform at 45 degrees and offsets it to the right so tall parts, and your platform itself, drain directly in to the resin tray; all while allowing you to keep the UV lid safely closed for as long as is needed. Fits for 3D Printer Creality 3D CR-10,CR-10S,CR-10 Mini. 4 Heated Bed Springs. These springs are designed to adjust the balance of heated bead. Material: Stainless Steel. Long service life and high durability. Item Type: MK8 Driver Gear. Application: for 3D Printer parts. Bore size: 5mm. The groove of this gear is about 1mm deep. Material: Stainless Steel. Also note that monitor settings may vary from computer to computer and may distort actual colors. TheTL-Smoother is an addon module for 3D printer stepper motor drivers. 1 x TL-Smoother Addon Module. Lower vbration lower noise smoother result! Fit for: All fdm types of 3D printers. 1 Heated bed, 2 Hotend Mosfet drivers. 32-bit LPC1768 ARM processor.100Mhz, 512kb Flash.Mini B USB - Prototype photos shows USB B. SD card slot for firmware upgrades and config file.Support SPI Displays like Viki2 and mini Viki(direct) and RRD Graphic LCD(adapter). Item type: Bowden Extruder. 1 BMG Extruder. The BMG utilizes an internal gearing ratio of 3:1 together with precision cnc-machined hardened steel drive gears to give. you a compact powerhouse for all your applications. This 2 in 1 out hotend kit is designed for Geeetech A10M and A20M 3D printer. Mix-color printing enriches your daily life~. Shenzhen Getech Co. Geeetech has been one of the most prominent rising star in the area of 3D printing in Shenzhen ,China, even the world, since founded in 2011. Nozzle Precision: 0.4mm. Part Number 3D-Printer-Nozzle. 20 nozzles. Note: Light shooting and different displays may cause the color of the item in the picture a little different from the real thing. 用于Creality Ender 3 Pro / CR-10 / Ender 5 3D打印机的升级铝挤压机驱动进给套件,可替代丙烯酸部件. TMC2208 Stepper Motor Driver Board. Copper heatsink (include transfer types) x1. Upgrade your 3D printer NOW ! Thermal conductivity of copper:401 W/(m K) (aluminum is 237).